"If it weren't for Dr. Karlin, I wouldn't be alive right now. He found a lump in my neck that two other doctors had missed, including a cardiac specialist, and sent me straight to the hospital for bypass surgery, saving my life. Thank you Dr. Karlin for your expert diagnosis and attentive care!" - William D., New Fairfield, CT.
"After going to Dr. Karlin for allergy testing and treatment, I was able to end the suffering that was caused by my seasonal allergies for the last fifteen years. I am grateful to him every day when I wake up with a clear head and the energy to go about my day." - Patricia F., Danbury, Ct.
"I have been going to Dr. Karlin since I moved here from New Jersey. And that was 16 1/2 years ago! 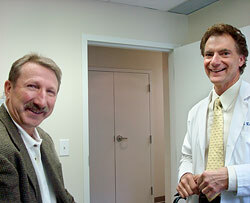 Dr. Karlin is one of the most pleasant doctors to have. He always listens and cares, and is more than willing to help with anything. I always feel very comfortable talking with him and his staff. They make you feel like part of the family. Thanks for everything, Dr. Karlin and staff! "Dr. Karlin has been my physician for two years now. As a pharmaceutical rep who calls on about 180 physicians from Danbury to Greenwich, CT., I literally was in a position to select any doctor I wanted. I selected Dr. Karlin. He listens well, is very patient, and keeps current with the ever changing face of medicine. I would highly recommend Dr. Karlin to anyone.